This is a recipe I created a few years ago, but which has become a firm favourite amongst beer lovers and loathers alike within my friends and family. 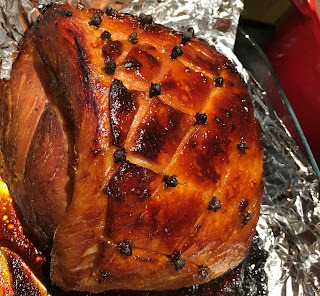 It's something I tend to make at Christmas but actually the ham is great all year round and much more cost effective than buying tiny slithers from the supermarket. Start with an unsmoked, uncooked ham (I usually opt for something around 2kg) and place it fat side down in a large pan. Next add enough beer to almost cover the ham (two or three 500ml bottles should do it), followed by the peel of half an orange, 3 tablespoons of brown sugar, a halved onion, a small handful of whole peppercorns and 2 bay leaves. I like to use a strong, bittersweet, malty ale such as Black Sheep Riggerwelter, Theakston's Old Peculiar, or my personal favourite Fuller's 1845. A stout also works well, but don't be tempted to go for anything pale and hoppy as the bitter flavours become unpleasant in the finished ham - trust me, I've tried it. Bring to the boil before covering with a lid and reducing the heat and simmering for two hours. Once cooked remove the ham from the cooking liquor and allow to cool for about 5-10 minutes in a colander. Once cool enough to handle remove the skin from the ham along with all but a thin layer of fat. (Feel free to keep the hammy beer broth to use as the stock basis of a future pig's cheek stew, otherwise discard). Score the fat in a wide criss-cross pattern and smother with a combination of 3 tablespoons fine cut marmalade and 1 of mustard, I personally go for Dijon though feel free to use english or mild mustards depending on your personal preference*. Next bake fat side up in the oven on a tin foil lined baking tray for about half an hour at 200*C, or until golden brown and glazed. What I like about this combination is the orange bittersweetness of the marmalade really marries well with the subtle beer flavour that permeates the ham during that long low braise. Serve the ham hot with a jacket potato and some sour cream, or leave to go cold and have it for up to a week with cheeses and chutney's. Perfect with a bottle of Fuller's Vintage ale or any other thick, rich barley wine. *If making the ham for christmas then also add a whole clove bud to each cross as I did in the photo above. This really increases the christmas aroma and flavour of the ham. You can take best essay service reviews, if you get first time good service. Every college administration always checks their writing review service. So you can easily take this service. I literally loved your writing. Hey, can you please inform me the smart double glazing best deals since it seems that you have great idea on certain things. help me at least to get an agent please! This looks delicious! I think I can use this receipt for Christmas dinner with my family and closest friends from thelivebuzz.com . I will serve the ham hot with a jacket potato and some sour cream, or leave to go cold and have it for up to a week with cheeses and chutney's. I think it will be perfect with a bottle of Fuller's Vintage ale or any other thick, rich barley wine. Woww… they all look amazing! I am gonna try them it!